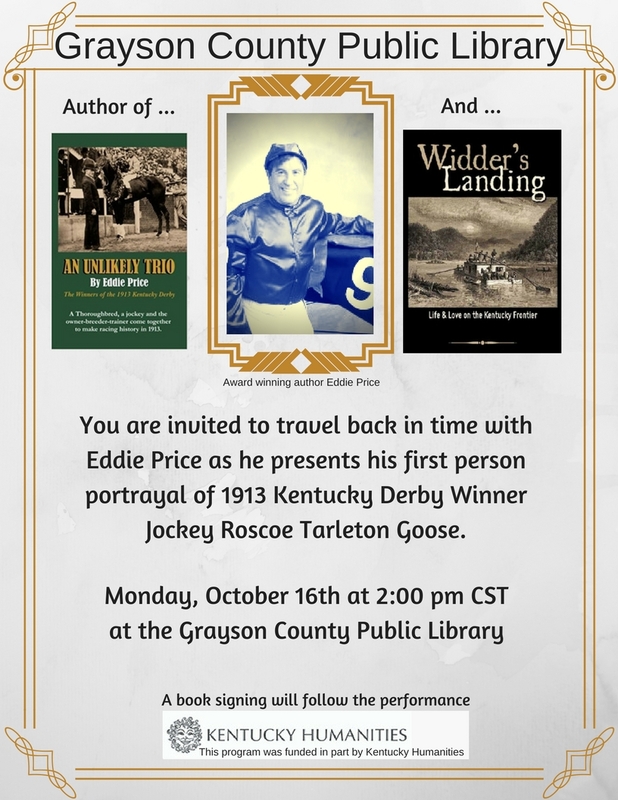 Award winning author of notable work Widder’s Landing, Eddie Price, will be presenting his depiction of 1913 Derby Winner Roscoe Goose, the real-life hero of his newest book An Unlikely Trio- The Winners of the 1913 Kentucky Derby. A member of Kentucky Humanities Council Speakers Bureau, Mr. Price has also joined the Humanities Council’s Chautauqua program with his portrayal of Roscoe Goose. Join us at Grayson County Public Library for an in-depth portrayal of 1913 Kentucky Derby Winner Jockey Roscoe Tarleton Goose! Roscoe Goose and colt Donerail made history with 91 to one odds: the worst odds that have ever been overcome in the Kentucky Derby, and a record that experts say will most likely never be broken. You’ll find more information about Eddie Price and how to purchase his books by visiting his website here. For more information on Kentucky Humanities visit their website here.